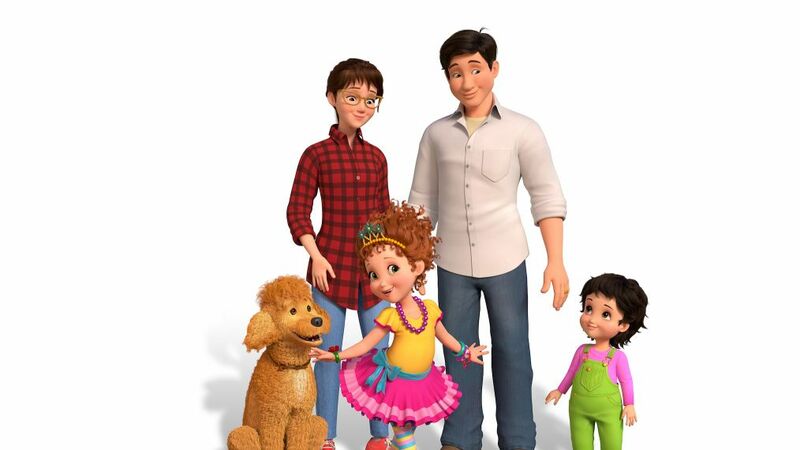 Disney Junior's upcoming animated series Fancy Nancy is one parents will actually want to watch with their kids! The comedy, which premieres Friday, July 13, is star-studded with favorites from the TV world. And TV Insider has your exclusive first look at the premiere episode, “Bonjour Butterfly"! Among those lending their voices are: Alyson Hannigan (How I Met Your Mother) as Claire Clancy; Rob Riggle (Modern Family) as Doug Clancy; Christine Baranski (The Good Fight) as Mrs. Devine; George Wendt (Cheers) as Grandpa Clancy; Dana Heath as Nancy’s best friend Bree; Tatyana Ali (The Fresh Prince of Bel-Air) as Bree’s mom; Kal Penn (Designated Survivor) as Mr. Singh; Ian Chen (Fresh Off the Boat) as Nancy’s cousin Jonathan; Chi McBride (Hawaii Five-0) as mailman Gus; Spencer Moss as Nancy’s younger sister JoJo; Malachi Barton (Stuck in the Middle) as Nancy’s friend Lionel; and Madison Pettis (Freeform’s The Fosters) as Brigitte. In the photo below, see Nancy Clancy (voiced by 12-year-old Broadway sensation Mia Sinclair Jenness, who played the lead in Matilda) singing the original song "When You Can Fly Again" to a butterfly.